Access to healthcare in rural communities is an ongoing challenge both nationally and in North Carolina. The combination of fewer facilities that are difficult to reach along with under- and uninsured residents creates scarce medical care in pockets of the state – including extreme Western North Carolina. Western Carolina University’s School of Nursing launched a family nurse practitioner master’s degree program in 1999 to meet a recognized need for primary care providers in Western NC. In 2015, as part of an initiative to increase access to underserved communities, the Golden LEAF Foundation partnered with Western Carolina University providing a grant to hire and train nurse practitioners in the region. 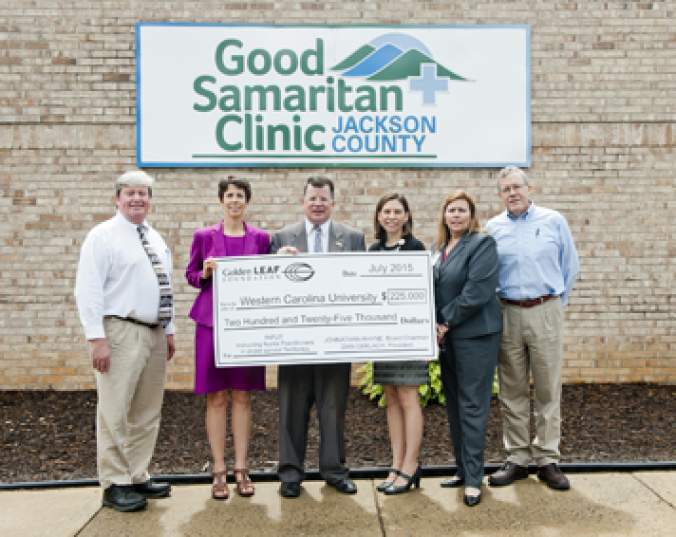 The two-year grant, called project INPUT (Increasing Nurse Practitioners in Underserved Territories) worked through the Good Samaritan Clinic in Sylva, NC to provide an alternative to emergency room visits for the region’s significant uninsured population. The project not only provided a nurse practitioner, but importantly trained additional graduate students annually creating a steady stream of increased and targeted healthcare expertise in this underserved community. Seven WCU and 20 FNPs were trained in rural clinical settings. The six western counties targeted in this program are designated health provider shortage areas by the U.S. Department of Health and Human Services. The Golden LEAF Foundation created a special health care initiative to help reduce shortages in the number of professional and highly skilled health care workers in rural, underserved areas of North Carolina. Research has shown that residents trained in rural areas are more likely to practice in rural areas.